Oct. 24, 2017, 10:31 a.m.
By Laura Hazard Owen @laurahazardowen Oct. 24, 2017, 10:31 a.m.
Publishers may feel (even) less charitable toward Facebook this week after news trickled out yesterday that the company is “experimenting” (in at least six countries) with a change to News Feed that moves “almost all non-promoted posts” to a secondary, harder-to-find “Explore” feed. In the countries where it’s being tested, it has resulted in “the biggest drop in Facebook organic reach we have ever seen,” according to one Slovakian publisher, and it’s led to fears that news publishers will have to pay up if they want their posts to be seen. Facebook — which claims it has no plans to roll out this test globally — went ahead on Tuesday and, at an event at CUNY in New York, released a set of “News Feed Publisher Guidelines” that aim to decipher the News Feed algorithm a bit and help publishers better understand “content guidelines, quality guidelines, and community standards to aid your efforts to find and engage your audience on News Feed.” (In other words, do this or we’ll bump your stuff to the secondary feed. Haha! Just kidding.) The panel included a discussion between Facebook News Feed VP Adam Mosseri and CUNY professor Jeff Jarvis. 1. INVENTORY. What stories have been posted by friends and publishers? The inventory is a set of stories that are shared by your friends and the Pages you follow. Your News Feed is primarily comprised of the content shared by your connections. 2. SIGNALS. Who posted this story? For this step, we consider hundreds of thousands of signals, like “Who posted this story?” and “When was it posted?” as well as small details we can discern about the viewing environment, like “What time is it?” “How fast is the internet connection?” etc. 4. SCORE. Relevancy Score. Then we use all of the consolidated signals to develop a relevancy score — a number that represents how interested we think users will be in that story. We hear from our community that they’re disappointed when they click on a link that leads to a web page containing little substantive content, or instead contains disruptive, shocking, or malicious ads. People expect their experience after clicking on a post to be straightforward. If we determine that a post might link to these types of low-quality web pages, it may show up lower in people’s feeds. This way we can help ensure people see fewer misleading posts and more informative posts. This helps to reduce the economic incentives of financially motivated spammers. Ads are specifically called out. Clickbait gets its own section, too. —Post headlines that set appropriate expectations. “21 Funny Reactions to Last Night’s Presidential Debates” accurately describes the story someone is about to read. try using text prompts and calls-to-action in your posts to encourage engagement. — Consider how accurate and informative the headline is before sharing the article to your audience so people can decide how they want to spend their time with your post. — Share articles with accurate headlines. Instead of relying on misleading headlines to intrigue the reader, share articles with accurate headlines that don’t exaggerate or sensationalize the topic and add your own voice to help drive genuine conversation around the content. — Withhold information in a headline. For example, the headline “You’ll Never Believe Who Tripped and Fell on the Red Carpet…” withholds information required to understand the article (What happened? Who tripped?). — Exaggerate or sensationalize content in a headline and mislead readers. For example, the headline “Apples Are Actually Bad For You? !” misleads the reader (apples may only be bad for you if you eat too many every day). Photo by SkyLuke8 used under a Creative Commons license. POSTED Oct. 24, 2017, 10:31 a.m.
Owen, Laura Hazard. "Are you a low-quality web page? (Are you sure?) 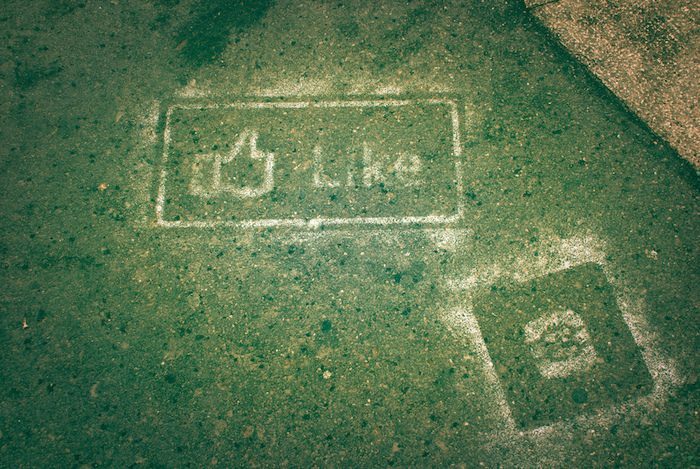 Facebook sheds a little light on its algorithm." Nieman Journalism Lab. Nieman Foundation for Journalism at Harvard, 24 Oct. 2017. Web. 23 Apr. 2019. Owen, Laura Hazard. "Are you a low-quality web page? (Are you sure?) Facebook sheds a little light on its algorithm." Nieman Journalism Lab. Last modified October 24, 2017. 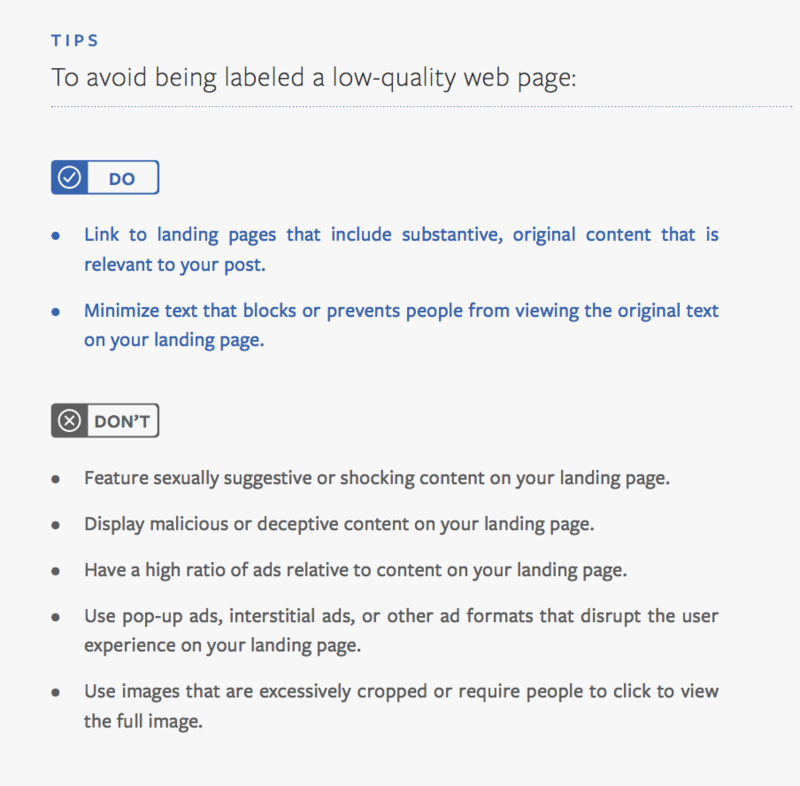 Accessed April 23, 2019. https://www.niemanlab.org/2017/10/are-you-a-low-quality-web-page-are-you-sure-facebook-sheds-a-little-light-on-its-algorithm/.